The University of Kansas’s student newspaper The University Daily Kansan carries an interview with Jim Juola, one of their professors, who is working on the European Comission’s project is called K-SERA: Knowledgable Service Robots for the Aging. Professor helps develop robot to help the elderly. There’s a neat comment by someone who says they would rather be cared for by a real robot than by a human taught to behave like one. The project is using the diminutive (60cm) NAO robots from French company Aldebaran, as seen in the following 3 minute video. Is this a perfect storm for healthcare IT and consumer health? Panel moderator Raymond Falci (Managing Director, Cain Brothers) set out a ‘storm map’—a hospital IT spaghetti chart that represented ‘streamlined process’. Business models in consumer health are fractured—whether payors seeking the next gen in disease management; pharmaceutical companies trying to increase falling sales; healthcare providers attempting to measure and manage risk (and will accountable care really work? ); and consumers reluctant to pay for anything. Prospect areas: Monitoring chronic diseases, other remote monitoring, acute care post-discharge management, member health status and wellness monitoring. Panel question #1: What are the obstacles and enablers to connected healthcare adoption? Nick van Terheyden, M.D. (Chief Medical Officer, Nuance): Prior experiments in paperless hospitals in 1990s unworkable because inability to transfer records and information. Current EMRs and tablets take too much time. Rachel Block (Deputy Commissioner for HIT, NY State Dept. of Health): State Health Information Exchanges (HIE or HIX) have been useful in delivering health information; most are getting tools (e.g. EHRs) to doctors. Now emphasis on programs—care coordination, public health, mHealth. Two factors supporting adoption—systems that are patient-centered, policies in standards and payments. The big question: Do we really know if prevention, monitoring and information (data synthesized) make a difference in outcomes? Adapting to change: Physicians find adapting to change like connected health very difficult because of the way they are trained: to take care of patients, provide good technical care, take responsibility for patients, not populations. Comparison: NHS short visit system versus longer consult and options in individual care (US). Other questions: current comfort level in technology and transferring skills to technology. Gopal K. Chopra, M.D. (CEO, Dauphin Health): The system is so broken we have to reconstruct it. IT is colliding with care—‘we built it so that we could bill.’ For instance: we have not figured out how to make data actionable in workflow; we have looming shortages of time (e.g. pediatricians where many doctors are not full time through careers), versus demand (birth rate). Can we succeed in taking healthcare out of the enterprise (hospital)? Panel question #2: What is the revenue model for advanced technology? Mr. Dhoble: Accelerant will be the CMS non-reimbursement for preventable readmissions in 30 days in October 2011. ‘Expert patient’ key factor (and can patients be ‘experts’?) Leveraging media to increase learning of healthy behaviors and increase understanding. Dr. Dagi: Questioned ‘scale’ paradigm. We may wind up with a two tier system like the UK or a ‘shadow system’ e.g. privately paid concierge medicine because ‘scale’ does not work. Dr. Chopra: There is NO WAY that the January 2011 start of adoption and qualifying for meaningful use works. If he were in private practice, he would run away from it! Dr. van Terheyden: Systems can’t extract information from the EHR and put into patient records as needed. 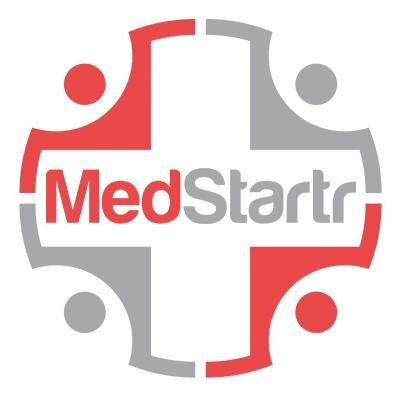 Mr. Dhoble: All the stakeholders (pharma, imaging companies, etc.) are lobbying for too much to be included. Dr. Chopra: Right now, we are not practicing ‘clean healthcare’ and EHRs aren’t going to change this. More on Dauphin Health: After the panel concluded, I spoke with Dr. Gopal Chopra who is their CEO. 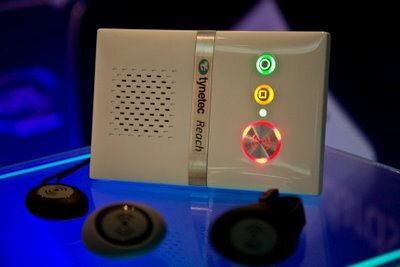 The early-stage company has designed a system, currently in test, that allows a parent to transmit information on an ill child via phone or web to a ‘virtual resident’ which compiles it and connects to the family pediatrician. Treatment instructions are returned in 10-15 minutes. The call is essentially triaged but speeds response back to the parent. It is in test: their two basic websites are at www.dauphinhealth.com and www.dauphinmd.com. 09.00: Today, in the hope of discovering something new, I will be concentrating on the exhibitor’s offerings. Intel/GE: The dead hand of corporate bureaucracy says I’m only allowed to give you their press release (and an old one at that)…but here’s what I picked up…Intel is exhibiting its Health Guide, and GE a screen-based demo of QuietCare. The latter is in the process of UK medical device approval so that the new joint company (still unnamed, it seems) will have a product range that covers all the bases. The launch of the new legal entity is scheduled for the New Year. Supra UK: Once again the Supra UK team have pulled out the stops to entertain with an attention-grabbing stand based on a US SWAT squad… but it’s the SWAP squad. Back in the summer they had a two-month opportunity for services with stocks of the old KeySafes to swap them for the new police approved C500 key safe, for only the cost difference, and they have reactivated the offer for the duration of the conference only. Tunstall: Today Tunstall has quietly (!) dropped something of a handgrenade into the marketplace – they have announced that they will make the specification of their radio receiver and transmitter devices available – for a license fee, of course. This is a smart market-share-preserving move, made in response to pressure from Tunstall system customers that want to be able to use other manufacturers’ sensor devices. 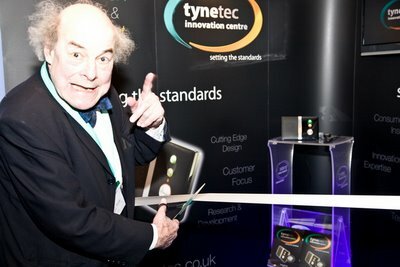 Tunstall press release (PDF) listing its other conference launch items, including a preview of the new MyAmie and PNC 6.2. STT Condigi: The second year exhibiting here for the Swedish company. Unfortunately, when I went past the bulk of their display material had not arrived. Burnside Telecom: The message from Burnside is that no landline or wireless network is actually reliable enough for life-critical monitoring but they are specialists in retrofitting devices into existing systems to increase the reliability by providing automatic fall-back connections. This is likely to be more effective and cost effective than replacing an old system. Fold Telecare and S3 Group: Nothing particularly new here, but they are reinforcing their presence as a major service provider in the Northern Ireland context. Coventry University: Here to publicise the assistive technology courses they offer, including work-based learning for staff that cannot be released to study full time. They have a Foundation Degree in Assistive Technology; a Masters in Assistive Technology, and an online Assistive Technology Learning Tool. Visit http://www.coventry.ac.uk/at for more information. Carers UK: The carers’ charity – here to put in a plea to suppliers to remember that the majority of people who could benefit from telecare do not have contact with statutory services and that direct marketing to them ‘ought’ to be on their agenda. CarelineUK: CarelineUK provided a sneak preview of the real time telehealth service that it is developing with partners CentriHealth, iMetrikus and Volt Delta. This will be a subscription-based service that brings together telecare and telehealth records for people with long term conditions and will enable multiple views of an individual’s health information for themselves, their carers, clinicians, primary care and social services, etc. Using this, CarelineUK aims to promote active involvement and personalisation of healthcare. Cirrus: The telecare and life safety integration company’s focus for the conference is to network with customers, existing and new, and to promote its reactive and planned telecare and fire maintenance services. Chubb: It is hoped that the just announced linkup between large Chubb and small, nimble Halliday James with its St Bernard GPS location system (first reported on TA from last year’s conference) will mean a more nimble Chubb. The system alerts carers by text message, email or through Chubb telecare, warden or nurse call systems using a new LocaLink remote trigger. Registered carers can ask for the user’s location via SMS and, where appropriate, it can be used as a simple emergency mobile phone enabling the carer to speak with the user. Chubb has also launched here a new ‘Secure Living Solution’ that combines telecare and fire monitoring and can work with a number of other suppliers’ systems. Press release (PDF) has details on both developments. Tallon Monitoring: Tallon is showing its new telecare monitoring product range at the conference for the first time. The devices can be used to send data regularly for trend analysis and presentation to carers and relatives via a web page. The devices, such as one that counts the number of times a fridge door is opened, can also show the results to professionals while in the client’s home, thus minimising gateway and call centre expenditure. 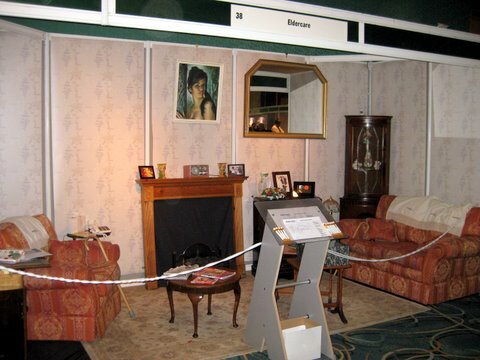 Eldercare: Stealing the show with its stand, independent telecare monitoring service Eldercare has created a room which has several thousand pounds’ worth of telecare kit embedded. But it is not easy to spot. 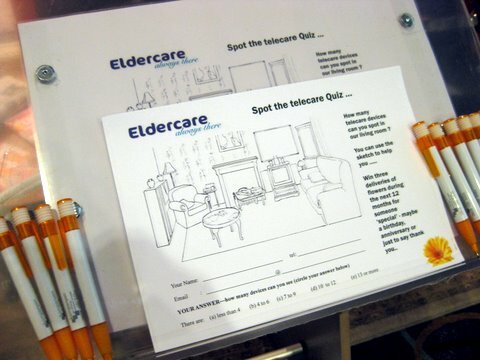 So they have come up with a ‘spot the telecare’ competition. It’s a great, fresh approach that makes a serious point. Honeywell HomMed: Launching a couple of things at the show – a new version of the monitor, the key feature of which is messaging from the monitoring clinician. The back-end Lifescan software has also had a substantial update, with better customised reporting. The other ‘launch’ is that Honeywell HomMed in the UK is no longer being run out of the US, but has a UK base in Leicestershire, indicating a degree of confidence in its prospects here. Questmark: A first time exhibitor at the TSA conference, videoconferencing specialists Questmark has a customer base of NHS organisations and are now looking to expand into the market for connecting health providers with patients at home. They were demo-ing high quality internet-based conferencing that is as simple to set up as a phone call. Telehealth Solutions: In addition to the CardioPod, which has had the greatest amount of publicity lately, Telehealth Solutions has been taking a slightly sideways look at the market and is displaying its kit for doctors’ waiting rooms, where people can have a pre-appointment assessment, and it has another setup aimed at occupational health departments of large companies which will help them reduce sickness-related absence. BT/Intel Digital Health: BT is showing its telecare/telehealth management software that, like Tunstall’s icp, makes it easier to track and manage the workflows associated with installations – except that it is manufacturer agnostic. Solon Security: Solon is new to the exhibition, but it is an established security device wholesaler with many council and housing sector clients. New on the market (and not yet on their website see this web page) is a digital replacement for optical door viewers. On the outside of the door, where the ‘spy hole’ usually is, is a lens with the bell push and a PIR and when someone approaches, the digital camera-sized screen on the inside of the door clearly shows who it is. The clever twist is that stills or video is recorded automatically onto a memory card and can be used as evidence of who visited when, whether they are welcome callers or otherwise. Red Alert: Kent-based telecare installation and maintenance service provider, here to reinforce relationships with existing customers and expecting to attract new ones. Network Communications Systems (NCS): Door entry systems for housing providers and care homes, and a reseller of Tunstall call alarm systems. buddi: the buddi company is doing its tracking thing even more slickly these days and its trial helping the Maudsley locate absconding people with mental health problems has been an even better success than previously reported. UK readers can look out for a ramping up of its publicity efforts after Christmas. Alvolution: The product comparison site funded by the West Midlands Regional Development body. Previously mentioned in TA when launched, but interesting enough to have a closer look and an additional report when I’m back from the conference. Centre for Housing and Support: Training provider to housing provider organisations. Caretech: Swedish company Caretech AB, here reminding people of its CareIP digital care alarm system first shown here last year, but also showing off its new, small fall sensor. Age UK: Here to show that it’s business as usual despite the organisational upheavals it has been through lately. Pivotell: Have I grown, or have Pivotell’s medication dispensers shrunk in the past few years? I hope it is the latter and not that little white pill…Well, the main Pivotell news is that the company has become the UK distributor for the ‘Minifone’ phone. This is a wrist-worn DECT phone with a sensitive microphone and speakerphone facility. What this means is that an older person who is slow on their feet can answer their landline phone without rushing to answer it (as you do), and risking a fall. It also has a dialout emergency call function which can go to carers or to a monitoring centre. See this webpage. Bosch: Today I discovered the answer to something that had puzzled me for a while, which is why Bosch hasn’t taken a more aggressive sales position in the UK. It seems that, recognising that there are significant changes in the technology due to bite in the next couple of years they are taking a long view and concentrating on helping services that already have their kit to make more, and more effective, use of it. And the reason they can afford to take that position is that Bosch is 90% owned by the charitable Robert Bosch Foundation, and investing in long term good is in its genes. (Which is why Bosch whitegoods have built the reputation they have for user- and environmental-friendliness.) I suspect that such a strategy might just pay off well in the long term. Jontek: The message from Jontek is that it is pleased to see that services are starting, at last, to catch up with the idea that monitoring by mobile phone is a sensible and low-cost option for some people and they will be pleased to talk to any service that wants to extend its offerings in that direction. Possum: Has just started to become the UK supplier for the Swedish NEAT telecare kit. As one might expect from a company that works with many severely disabled people, it has chosen to promote a system with many fail-safe features. Philips: Still demo-ing its Motiva system and, like some of the other big companies, appears to be content to play for the long term, slowly extending its customer base and learning with them how best to introduce and implement telehealth monitoring while they develop new devices and systems behind the scenes. Grosvenor Telecom: Long established independent telecare kit installation and maintenence company covering Wales, West Midlands and North West England. Air Products: A first time exhibitor at this conference, and new to the telehealth field, Air Products main related business is the supply of gasses to patients at home. They have engineers and nurses and could work collaboratively with staff in the field, such as community matrons, because in many cases they are already in contact with them. A key feature is that the commissioner only pays for the service delivered – no capital outlay required. Tribal: Not a new name to many parts of the NHS where Tribal provides services in a number of fields, but it’s a newcomer on the telehealth scene. However, expect to see more about them in the future as they are partnering with Intel/GE to provide one of the main ‘missing ingedients’ in the latter new company’s offering – help and guidance to the system users, both end users and professionals. The Economist summarizes the mHealth Summit in a brief but meaty article that summarizes the massive detail presented. Gates: beyond the pilots, technology has to be replicable and scale up. Anta (Inter-American Development Bank): ‘We know little about impact and nothing about business models’. Business interest is stimulated by 1) cloud computing applications, 2) US adoption of EHRs, 3) developing countries’ mHealth ideas and business models (such as mobile banking), 4) substituting technology for medical labor (Healthpoint Services and P&G support). M-powered: the convergence of mobile telephony and health care is underway. 12.00: The conference is just opening – check back in a couple of hours! 22:00 The aim of my reports is to give people who are unable to attend a flavor of the conference. Well, for context, with 800 people attending during the three days and over 40 companies exhibiting it is still big by UK standards. It is notable that the numbers are up despite these difficult financial times. The opening afternoon’s plenary sessions sent a clear message that telecare call monitoring services should be looking towards telehealth monitoring as a future business opportunity. The TSA is looking to appoint someone to focus on it, and Trevor Single, TSA CEO, announced that they are aiming to produce a Telehealth Code of Practice in 2011. Kevin McSorley from Fold Telecare in Northern Ireland gave an overview of developments during the past 15-years of the TSA and its preceding organisation. His conclusion was that 15 years is a long time for a quiet revolution…so now is the time to turn up the volume. James Ferguson, professor of emergency medicine and clinical lead to the Scottish Centre for Telehealth (now part of NHS24) followed with wide-ranging examples of teleconferencing with patients in telemedicine, most of which have been covered in Telecare Aware. The main ‘takeaway’ was that in Scotland the aim is to have a national telehealth service that will focus on: people with strokes; COPD; paediatrics, and mental health. “The most difficult task” he said [speaking as a persuasive person who has experienced it], “is marketing to the organisation, not the patients.” He also added that in the future, healthcare professionals should start to feel nervous if first contact with a patient is not mediated by electronic triaging. Chris Crockford opened the throttle on further telehealth thinking with a presentation that explained his interest in remote health monitoring as a pilot, a mountaineer and the ex-Business Development Director for McLaren F1 where the scale and complexity of real time remote sensor monitoring already exceeds anything envisaged for health purposes. He then developed the theme of the read-across to technology that people actually want to use and/or find intrusive. He also provided the quote of the afternoon: “Age…appearing in a mirror near you soon”. The fourth speaker was Keith Nurcombe, Head of Healthcare for O2, whose three new telehealth projects had publicity recently. (TA item) What was significant about his presentation was that the emphasis was not on the technology despite O2 being part of the Telefonica group which employs over 1,000 people across Europe who are concentrating on developing new technologies. His emphasis was, instead, on listening to the needs of the potential users (“because that’s how O2 got to be so big in the UK so quickly”) in order to make the technology into the enabler and not the driver of developments. Thanks to the playful and rather provocative style of the Conference Chair Roy Lilley, the afternoon was rounded off with a lively discussion between the panel and audience members, some of whom seemed slightly stunned by the emphasis on telehealth and several of whom noted that disquiet about the design of most currently available kit had been expressed by a number of speakers. Perhaps, at last, the spell of ‘it saves lives, therefore is must be good’ has been broken. Tomorrow’s reports will concentrate on the exhibitors’ wares. Eric Topol is a consultant cardiologist in the US and an ‘evangelist’ for mobile phone-based remote patient monitoring. This 17 minute video of him speaking at TEDMED illustrating current technologies and trends was released back in February 2010, but just come to our attention. Watch the video on TED site so you can see, and possibly add to, the comments. Eric Topol’s blog. Check this space for updates and links. As this will be a short day ending at 3pm, most news will be summarized in the afternoon (ET). Rockefeller Foundation announces an additional $1 million in funding for the mHealth Alliance. This follows the total of $2 million in funding announced in the past two days from Norway’s Norad and HP. Running coverage of the mHealth Summit. Check this space for updates and links. Insight on what’s next from Bill Gates: mHealth, mCommerce and robots. Excellent summary of the Bill Gates afternoon keynote (no live video feed). Tip of the hat to Alex Howard of Gov20.govfresh. HIStalk for Day 2 (and last for him): the keynotes and supersession plus a small session that included Vitality GlowCaps, PhiloMetron’s PMTS sensor patch and UCLA’s Dr. Ozcan’s LUCAS microscope [TA 21 May]. A must read for a contrarian, witty POV. Hat tip to the (anonymous) author, whom we hope finally got something decent to eat. We will miss him tomorrow. More Text4Baby news: a multi-million dollar commitment from Johnson & Johnson to the National Healthy Mothers, Healthy Babies (HMHB) Coalition to expand the program both numerically and to add new features; Department of Defense and HRSA (Health Resources and Services Administration) are evaluating the program for the underserved and military families. PR Newswire. Blog coverage of Day Two: Brannon Cullum in the Alliance for Youth Movements blog, Day Two highlights (including more on Mr Turner’s musings). Do read down to Theresa Cullen of the Indian Health Service on how in health, our Native American citizens have attributes of both the developed and developing worlds, and Patricia Mechael’s ‘Top Ten Lessons for mHealth’. Healthcare IT News hosted live blogging of Tuesday only. CoverIt Live replay (direct link to page): keynotes by Ted Turner, the AM supersession and the Bill Gates luncheon, concluding with Aneesh Chopra’s hyperbolic pep talk. They also picked up the tweetstream from #mHS10 after midday. HIStalk conference summary. Observant–and not above poking fun. Compared to others’ (HIMSS) focus on population health; heavy on the academics, NGOs, global health people–‘serious people getting serious education mostly working for noble causes underwritten by government money.’ See his points about 75% down on the mHealth business model or lack thereof; the general supposition is that mHealth will never be profitable. Too extensive to excerpt here–they deserve extensive discussion. West Wireless Health Institute announced its first engineering prototype, Sense4Baby, a non-invasive fetal and maternal monitor that is portable and uploads data to the internet. It incorporates cardiotocography, standard technology for measuring fetal heart rate and uterine contractions, which is typically administered in a clinical setting for 20-30 minutes per visit and is used in high-risk pregnancies. Demo at their booth #205. Release. mHealth Alliance to receive a two-year, $1 million donation from HP. This funding will assist the Health UnBound (HUB) online community and the Maternal mHealthInitiative. Release. Mobihealthnews on morning keynote speaker Dr. Francis Collins: increasing number of grants for mobile health research, highlights of NIH-funded applications and devices, the difference between developed and developing markets. While Telecare Aware will not attending the mHealth Summit, here is how you can follow it as it happens. mHealth Summit website streaming video (and Twitterstream) here . Alternate live feed is on mHealth Alliance website here. Live only for keynotes and ‘supersessions’. mHealth Summit’s YouTube channel here. Posted interviews: Microsoft (Kristing Tolle), McKesson Foundation (Carrie Varoquiers), Qualcomm (Clint McClellan). 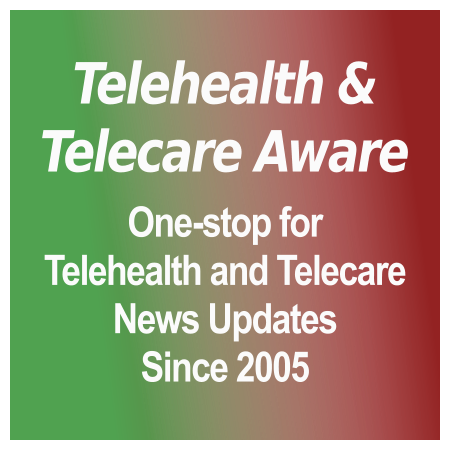 Telecare Aware is a media partner of the mHealth Summit.